"The thing that struck me was how long the tentacles [are] and the colour," Mr Smith said. "It was so vibrant and pure." Jellyfish expert Lisa Gershwin says it is probably a new species. "And honestly, being purple it alerts me to the fact that it might be a new species. "I think it's a better than even chance that it's new to science." Ms Gershwin, from CSIRO marine and atmospheric research centre, warned even though the jellyfish was dead, it can still sting. "It can still give you a wallop, although this guy's probably not a real major stinger," she said. "He's not in a really stingy group." 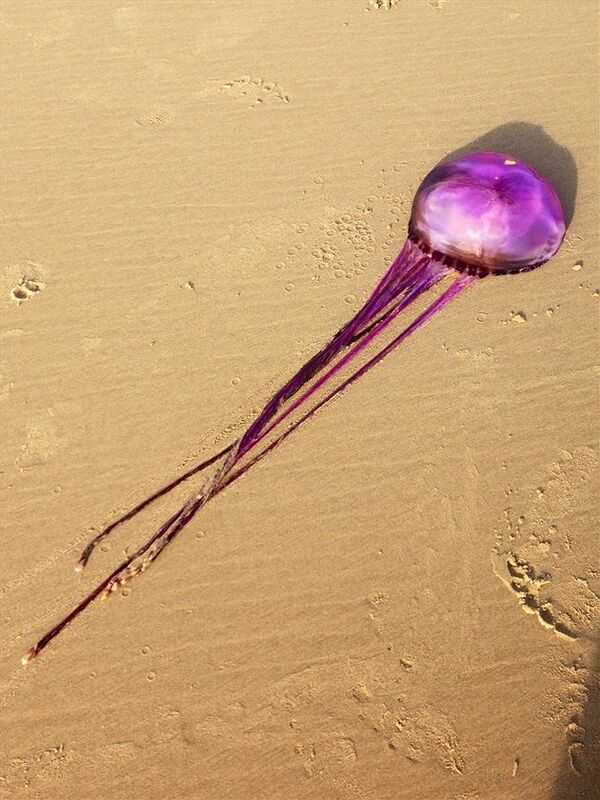 Ms Gershwin says the jellyfish belongs to the Genis Thysanostoma group, which are not common in Australian waters. "To see a Thysanostoma is a real treat because they're not really common, we get reports of them maybe a couple a year," she said. "I've never seen it in purple." Ms Gershwin says this type of jellyfish is recognised by their unique metre-long tentacles, which they use to feed. "Believe it or not those little arms are covered on all sides with tiny mouthlettes," she said. "Thysanostoma doesn't have one mouth like other jellyfish, it has thousands of tiny microscopic mouths and each of those mouths will eat as much plankton as it can catch." Ms Gershwin had trouble containing her excitement when she first saw the photos. "To see one in purple, come on, how cool is that," she said. "They're usually kind of brownie-beige sort of. SEA Life Mooloolaba and Ms Gershwin are analysing the jellyfish.